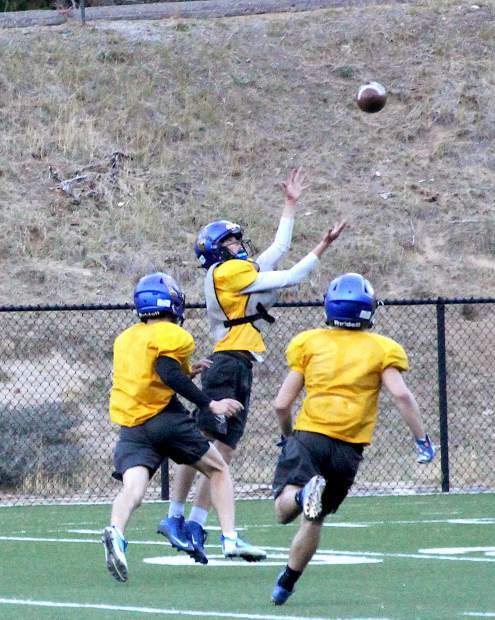 South Tahoe sophomore Drake Lathrop hauls in a long reception during Tuesday's practice. 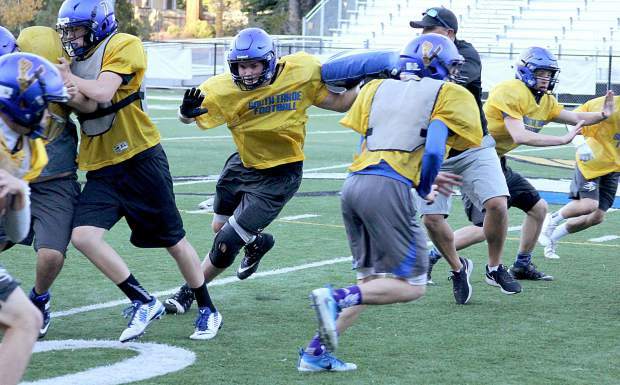 South Tahoe's Jackson Binns pursues a ball carrier Tuesday during practice. South Tahoe senior Logan Langemeier fights off a block from head coach Louis Franklin Tuesday during practice. 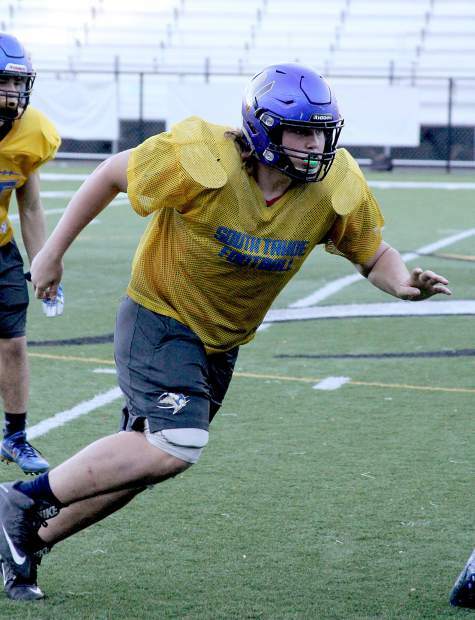 South Tahoe senior lineman Logan Langemeier remembers playing rival Truckee last season. He remembers the heartbreak at Viking Stadium. He also remembers the satisfaction of celebrating on the Wolverine’s home field after knocking them out of the playoffs. South Tahoe lost 21-20 in the regular season battle for the Sierra Bowl trophy. And that loss was a bitter pill to swallow. After the 28-20 playoff victory, Langemeier and the Vikings celebrated on Truckee’s turf for a while when the final seconds ticked off the clock. Kickoff for Saturday’s game is at 1:30 p.m. in Truckee. 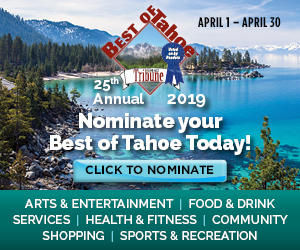 South Tahoe is 5-3 in league and Truckee is 6-2. 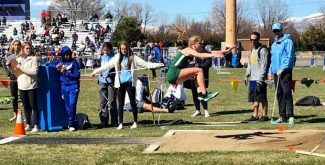 The winner Saturday will get a first round home game in the Nevada Interscholastic Activities Association 3A Northern League playoffs. If the Vikings do beat their rival to the north, they will again have to defeat the Wolverines the very next week in the first round of playoffs. 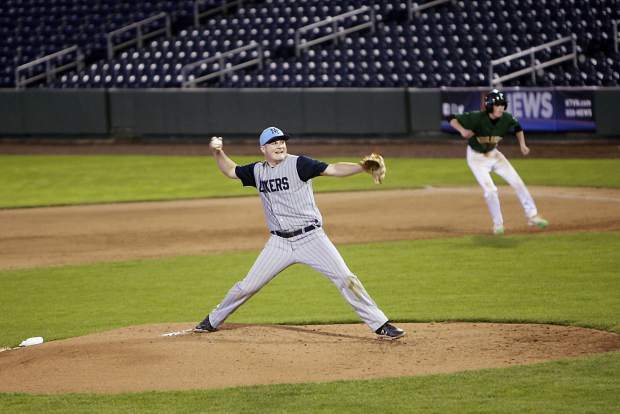 Just ask Truckee how hard it is to beat a rival twice in the same season. Last year’s playoff win was the first for South Tahoe against Truckee in their last eight meetings. If the Vikings lose, they’ll earn the No. 5 seed in the six-team playoff bracket and be on the road, likely at Spring Creek (6-2 Northern) or Churchill (6-2 Northern). For the seniors, they know what’s coming when they step onto the field in Truckee. There will be hoards of fans and lots of noise from each passionate fan base. The field may be moist. And there will be a song playing that drives the Vikings out of their minds. Truckee averages 260 yards rushing per game and about 160 yards through the air. Quarterback Marcus Bellon has completed 79 passes and 23 have gone for touchdowns. The Wolverines’ top three receivers have 48 catches between them and 20 of those have gone for TDs. The Wolverines also spread the wealth at running back. They have eight rushers who have at least 186 yards for the season and three who have over 400 yards, but nobody has reached 500 yards yet. On the Vikings’ side, when they run the ball, Jakob Costley gets the ball 75 percent of the time. He has gained 977 yards and scored 10 TDs on 125 carries. Cain is the team’s leading receiver with 39 catches for 752 yards and six scores. Castles, who missed two games and change, has 26 receptions for 575 yards and a team-leading nine TDs. The Vikings average 229 yards through air per game and 161 yards on the ground. 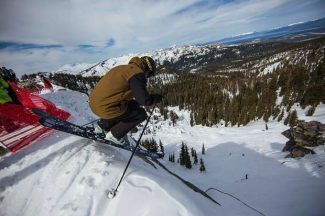 Practice was “ramped up” this week at South Tahoe. There was more intensity and there was no patience from the coaching staff for mistakes, especially the mental kind. The weather forecast for Saturday’s game calls for sunny skies and an afternoon high of 73 degrees with light winds.